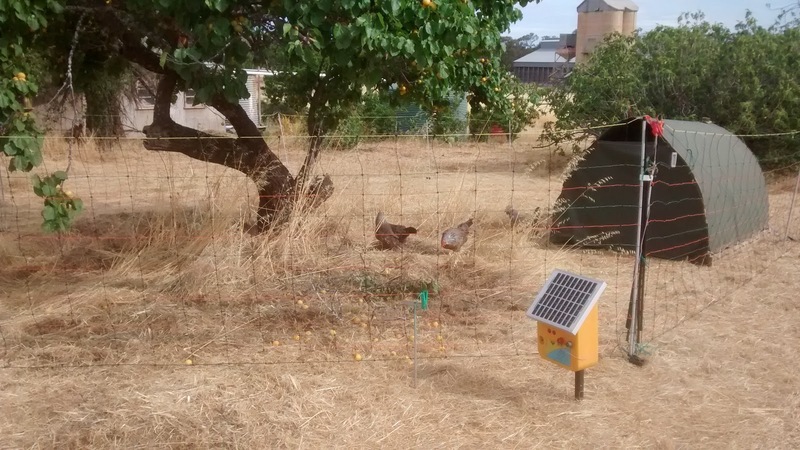 The chooks are under the apricot tree and fig tree too. The funny thing is, we didn't know we even had an apricot tree until just this week, when the fruits started ripening and falling to the ground. YUM! The chooks were under the eucalypt trees near the top of the property, but it wasn't a big deal to move them. Especially since we had only just flail mowed the area around the fruit trees. It was a simple case of setting up the fence, moving everything over, and by dusk we took the three (remaining) chooks and put them on the perch in their new area. They awoke to the smell and taste of fresh apricots, and immediately started to work on cleaning them up for us. This is exactly why we got the electric fence in the first place. We direct the chooks to where they need to be. It's an excellent system. Sadly we've lost most of our chooks to heat and/or old age. Victor, our lovely rooster, has also passed on. With only our 3 young chooks left, and no crowing, it's a little quiet out there right now. We're looking into getting some more, eventually. Thinking that Dorkings - a heavy English breed - may not be the most suited to their current environment. (I think they would have rather us all moved to Tasmania.) We will think carefully about the chooks tolerance for heat before getting any more. We'll see.